The second weekend of March saw me driving to Holland from London to take part in this massive annual event which is held at ahoy Rotterdam. A big old events centre which at the same time held a Motorcycle show which were show casing all different types of Harley Davidsons and choppers etc. I grabbed 30 minutes and went in and had a look. Now I’m no biker, but some of these machines didn’t half look lovely. It actually got me thinking that I might have to bring my midlife crisis forward and go out and treat myself to one of these 2 wheeled beauties. Anyway back to the tattoos. A busy Saturday and Sunday was had tattooing the lovely people of the Netherlands. My first Tattoo on the Saturday was a convention nightmare!!!! She was a first timer (Not that I have a problem with first timers) and was adamant she wanted it on her chest. I sketched the design, placed the design into the position to be tattooed. Everything hunky-dory so I began tattooing. From start to finish she wouldn’t sit still!!!!!! Not what you need when working at a tattoo convention in front of thousands of people. 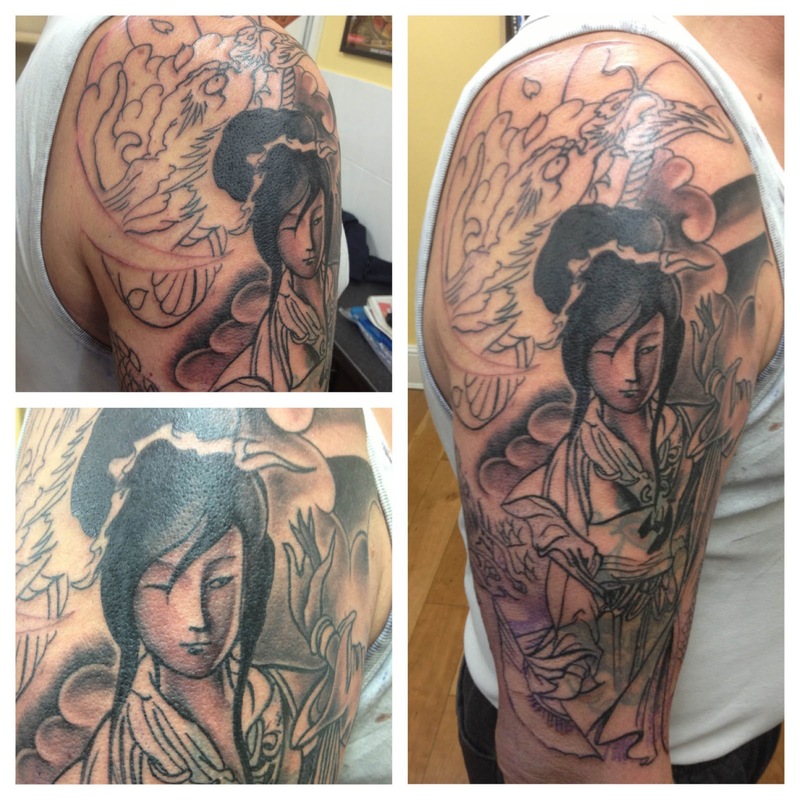 I got the tattoo finished and then proceeded to work on her partner’s tattoo. They both had the same tattoo with slight variations. 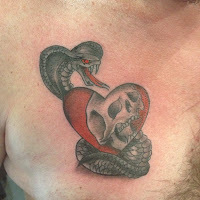 Over the weekend I Tattooed all sorts of traditional designs such as snakes, Hearts, skulls and swallows, then it was beer time with the other artists. Remember all that snow that poured out of the sky on the Monday in northern France and southern England??? Well I got caught in it on route back to London. Slowed me up by an hour or so due to the euro tunnel (probably on the English side) balls-ing up. Other than that, that was the only hiccup that occurred over the weekend. 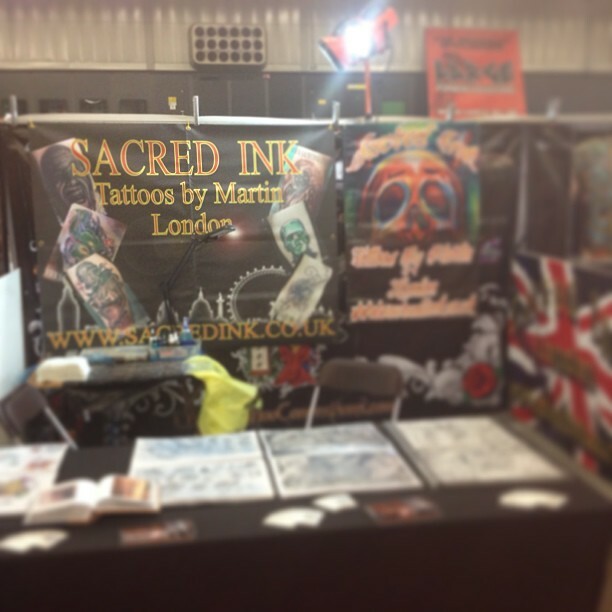 The Great British tattoo show 25th 26th May 2013. The show is hosted by skin deep magazine at Alexandra Palace. If you fancy showing off and want me to tattoo you there. Call the studio on 020 7733 1220. 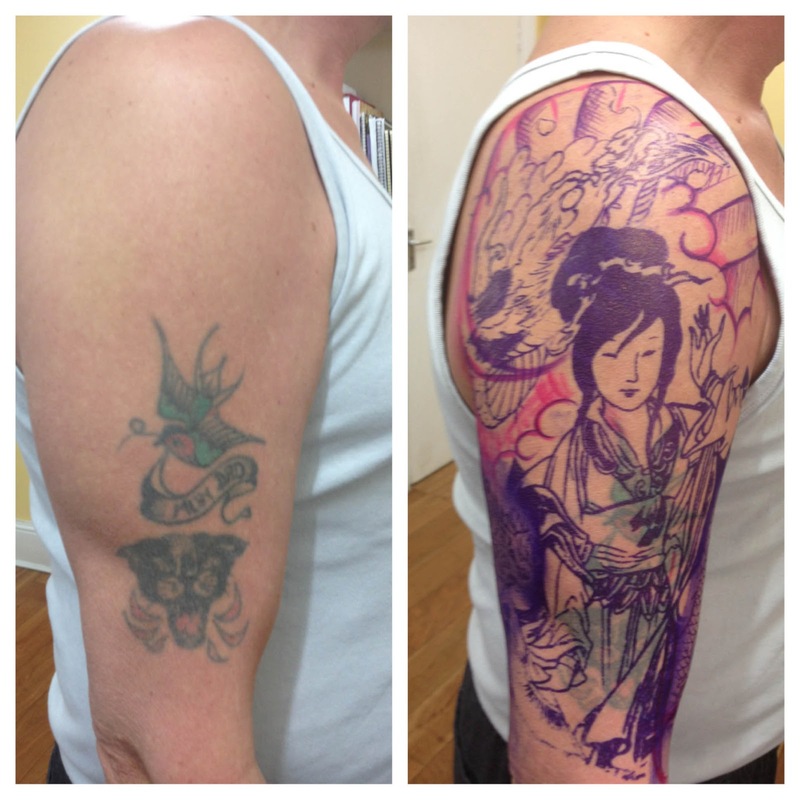 Ok So I started another cover up tattoo today. Not a big deal you’ll probably be thinking. Yeah it’s not a big deal for me as they’re pretty easy to cover up once a design has been sketched out and chosen to go over the top of the unwanted tattoo. But it is a big deal for the person who's probably been psychologically damaged due to being butchered by some hack somewhere. My main point here is and as the old saying goes. Think before you Ink! Never ever rush into getting a tattoo. You need to think about what you want to get tattooed, where it’s going and the artist that is going to do the tattoo. Design and placement are important. An arm full of clouds isn’t a cool design and a tattoo artist who is in the basement of a clothes shop or a nail/beauty salon isn’t a tattoo artist so watch out. More & more people seem to be making the mistake of getting a badly done tattoos. Things like a full sleeve of clouds. Which has not only been badly tattooed but badly composed (Designed) simply because the tattoo artist has no clue what he/she is doing. Artistry wise and tattoo technically wise. This is when it becomes a problem and then I’m called into to save the day with a cover up. For a full explanation of what a cover up is Clickhere. 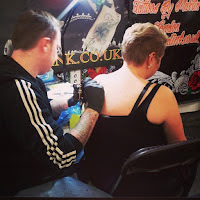 Most people are not educated in the world of tattooing and think that any old shop with a sign saying Tattoo parlour is an excellent Tattooer. It’s got pretty popular over the last 5-6 years wouldn’t ya say. All because of things like these pesky scripted TV shows. (yes they’re scripted!!!! it’s all acted out and rehearsed and edited etc., Getting a full sleeve in half an hour is impossible) This has attracted the attention of fly by nights who think it’s an easy quick buck and a rock ‘N’ lifestyle. ok so my word of warning again is. Think before you INK! If you have no idea what you want to have. Find a reputable tattoo studio with reputable tattoo artists and ones that you’re comfortable with. (Click here for south London’s best tattoo studio www.sacredink.co.uk ;) Go chat to them. Look at their portfolios of tattoos and drawings. Look at the flash on the walls. Get some ideas! Don’t look at a celebrity sportsman’s arm which is flapping around on a field and see a mish mash of black and grey and think I’ll have that. You can have what you want, with-in reason. So come on down to the Sacred Ink tattoo studio London for a look of my artwork,the flash on the walls and the photos in my book. 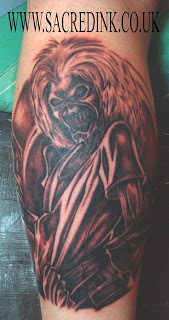 The tattoo below is unfinished and I will post the finished result... It will be amazing. I will be driving to Rotterdam again. Door to door time wise it takes 5 hours, it takes longer to fly to Holland than to drive. 7 hours flying 5 hours driving, work that one out! Again that’s door to door. Get on at Folkestone on the Euro-tunnel then out the other end at Calais for a 3.5 hour drive doing speeds of up to 130Ks an hour, and legally ;) They seem a bit more relaxed in Europe about the speed limits than this nut house. Last year was a busy event. I did some lovely tattoos. I’m hoping to do some more again at this year event. Maybe I’ll get a spare hour to take a break have a beer and maybe put one in a competition. Who knows let see what happens. One of my Dutch regulars John Smit, who I done a tattoo for of Iron Maiden’s Eddie at the Utrecht Tattoo convention will be making it to the show this year as he has put in a request for me to draw up something for him and his missus. The tattoos that I recall doing last year are some praying hands on some American dude and then a flower on some sweet looking Dutch chick who is hopefully there again this year. On the Sunday I did a load of black and grey tattoos which I seem to get asked to do a lot of. 2 days of solid tattooing and a night of partying with a bunch of tattooists. We were all put on a boat which chugged around Rotterdam, and it was all you could eat and drink which was a nice touch.